Are you trying to potty train a puppy? Potty training Reya, I have to admit, was a long, painful road. While training Ivi has been much better, she does have room for improvement, especially since sometimes she has problems making it outdoors or to her approved potty place indoors. Now that she has a bit more control over her bladder, and over some tummy issues she has been having, we decided it’s time to try getting the potty situation under control. Even better, she seems mentally ready and doesn’t really like when has accidents (she runs and hides if she has an accident). As we were getting ready to buy items for potty training, we were approached by PetSafe, who asked her to try their innovative potty training system – the Train n Praise Potty Training System. PetSafe Train n Praise Potty Training System: What is It? Looking for a fun and rewarding way to paper train your dog through positive reinforcement? If so, we think you will love the PetSafe Train ‘n Praise Potty Training System. 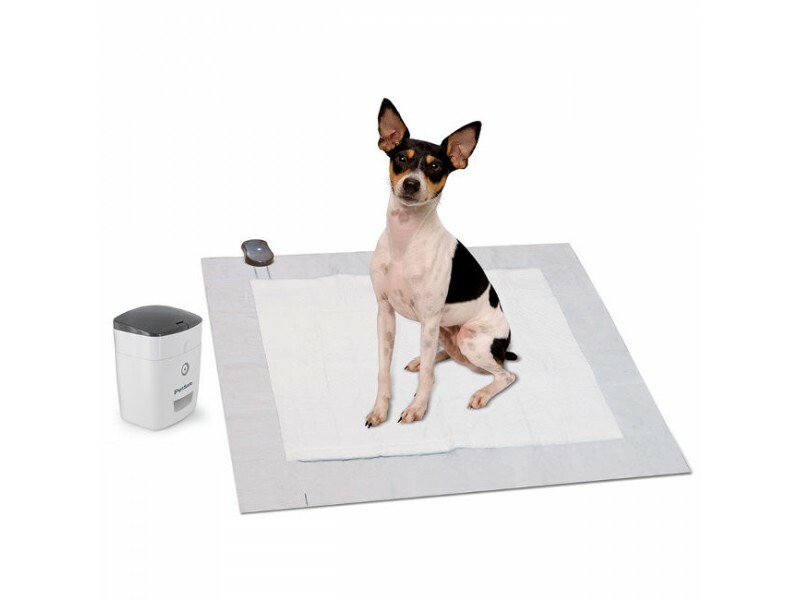 This fun kit pairs an absorbent pee pad with a treat dispenser for easy house training and obedience lessons. This convenient and consistent potty training tool uses treats to encourage good behavior in your dog and encouraging them to use potty pads while you are away. It works through a special replaceable pee pad, which has moisture sensors built internally into the pad. When these sensors get wet, it wirelessly sends a signal to the treat dispenser, which rewards your dog with their preferred treats or kibble. As well, pee stays in the leak-proof bottom layer of the pad, making sure the mess stays where it belongs and not on your floor. This system works very well for teaching puppies and non-house broken adult dogs, who are learning bladder control. Best of all, even once your pup is fully trained, the treat dispenser can be reused with its remote to help teach your dog new commands and better behavior. Who knew training could be so easy? To more for yourself, check out the video below on this awesome system! Okay, I have to admit, this is one very cool system! While we are still in the early stages of training, Ivi has so far responded very well to the training and seems intrigued with something that dispenses treats! With how treat motivated our Ivi bitty puppy is, we can’t say we are too surprised. Even though we likely have a bit before she is fully trained, I won’t be surprised if we have a fully paper trained puppy in two weeks to a month. Our smart little girl loves the system and can’t wait for training time now, even if it means she has to pee on the strange pad! Honestly, I think this may be the best invention for dog owners everywhere since it makes paper training so much easier for food motivated dogs. Based on our own experience, we are happy to give the PetSafe Train n Praise Potty Training System an A rating and highly recommend it to all of our readers! Want to purchase this awesome system for yourself? You can buy the PetSafe Train n Praise Potty Training System on the PetSafe website for only $134.99, or if you dog is already potty trained, you can buy the treat dispenser alone for only $79.95. Looks like a great system. Will have to try this when we get a puppy. Wow nice to have an all in one system like this that seems to work so well. It seems that it is a good way to keep dogs and their owners from getting too stressed about the training. OMG! That is so cool. I would have never thought such a thing could exist. Lola is 8 months old and no matter how much news paper we put she still pees on the floor. She will go to the newspaper and instead sitting in the middle she will sit on the edge. Also I could have the patio door open she still will go to the newspaper and pee on the ends of it. Somehow Lucas got it with out much effort. And another thing Lucas will go to the door to let us know he needs to go out and pee. Lola doesn’t and like I said the door could be open she won’t go potty. Animals are so smart especially puppies. This sounds super cool. I could have used this with my Lhasa Apso. My Australian Shepherd caught on much quicker, but it’s still a pain to do. This looks like something, if I got another pup, I might consider. Nice wish this had been around when my fur babies were puppies. 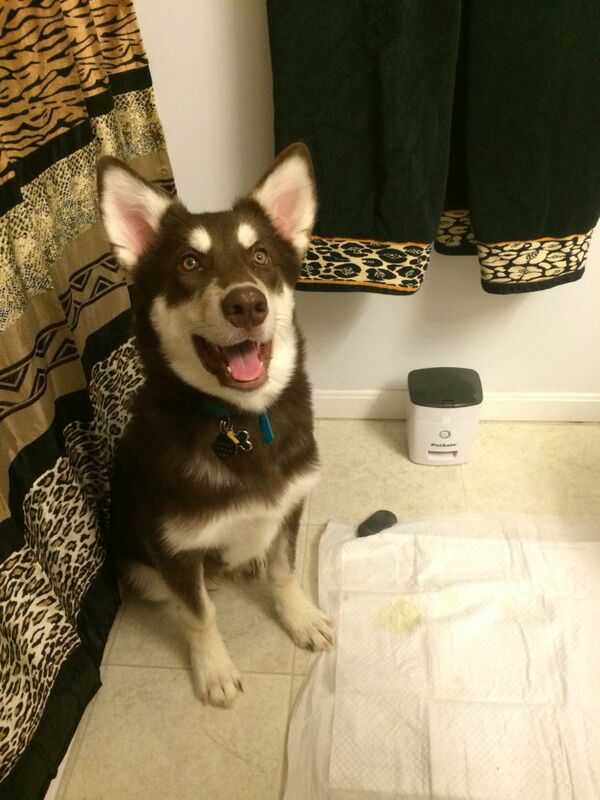 Potty training was difficult with my youngest dog. I will remember this when we get our next puppy. i like this, i have an middle child that will go when i am not at home, but not on the pads always, my oldest is having problems b/c she cant hold it but that comes with age, she will be 14 in 2 wks and having health issues. i am going to look into this for my middle child, although she is a real foodie so she may just do it to get a treats. It seems like an eternity ago when I did puppy training. It seems much more difficult now. I’ll be using this on my puppy! This looks really like a neat idea & rewarding to reinforce good behavior, if it is working that well for you, it sounds like a great idea, would love to try for a stubborn small dog. I would love to try this for my puppy since we are having a hard time potty training her to go outside. Thanks for this great review and introducing me to a new product! I seriously need this. Im struggling with my 9 month old puppy. He was house broken but then we moved twice in two months. He is so confused. I need the help! Amazed that it can be done as quickly as 2 weeks. Very useful system for puppies. This is a great system! I like how it instantly provides the reward for appropriate behavior. This sounds like a great way to train a puppy. This sounds like a great way to train a puppy. I can see it being very useful when we are not at home to provide instant gratification. I really like the positive reinforcement training here with the automatic reward system. I can truly see this working. I am really having a hard time Potty Training my Puppy, I decided to get Him Puppy Pads because He would go wherever He wanted to, but I also have a Doggy Door, but He wants to still use the Pads, if I rake away the Pads He will go on the Floor, I am nor very mobile, sometimes He will go Outside, but then He will still go inside too, I tried to train Him to go Outside by standing near the Doggy Door and then giving Him a Treat when He went, but I think that He thinks that if I am not there to give Him a Treat then He doesn’t need to do His business Outdoors, since I am home all day I didn’t use Crate Training, my other Puppies went Outside willingly, just seem to have trouble with this one. Any tips would be great!